AutoMax™ shredders offer a truly walk away shredding experience, automatically shredding stacks of paper at the push of a button. Now you can shred common stacks of paper as they are – no pulling out staples and paper clips or even smoothing wrinkled papers. Simply load the tray, press play and walk away with confidence. While AutoMax™ shreds, you get back to business. AutoMax™ machines utilise durable cutting blocks with high sheet capacities and powerful motors. High shred speeds paired with increased pick rates make AutoMax™ machines 82% faster* than the competition. Patented AccuFeed™ Technology provides accurate shredding for peace of mind that confidential information will be destroyed. AutoMax™ shredders feature both auto feed and manual feed built into the same machine for maximum convenience. Shred a lot or a little with ease. AutoMax™ shredders feature the best of both worlds with auto feed and manual feed built into the same machine. Now that's convenience. Load Tray and Walk Away. Manual for quick shredding. Now you can shred in-house with the same convenience, but for less! It’s hard to imagine that more convenience, increased efficiency and higher security can actually come at a lower cost. With Fellowes® AutoMax™ shredders, in-house shredding can provide time and money back to your business, boosting productivity. Shredding jobs can now be taken care of faster than having to wait for outsourced services and without the worry of confidential documents getting into the wrong hands. 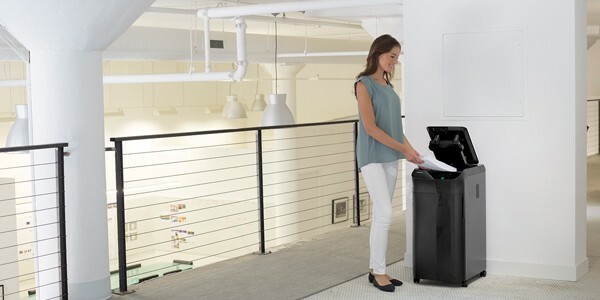 Convenient automatic shredding so you can walk away and focus on other priorities. No more hidden fees or excessive service charges - you can put that money back into your business! Know who is handling your confidential information so you can help prevent a security breach.